[130 Pages Report] The service virtualization market is projected to grow from USD 385.5 Million in 2016 to USD 1,040.8 Million by 2022, at an estimated Compound Annual Growth Rate (CAGR) of 18.50%. The forecast period has been considered from 2017 to 2022, while 2016 is considered as the base year for estimating the market study. The main objective of this report is to define, describe, and forecast the service virtualization market on the basis of segments, which include component, deployment type, vertical, and region. The report provides detailed information regarding the major factors influencing the growth of the market (drivers, restraints, opportunities, and industry-specific challenges). The report forecasts the market size with respect to the 5 main regions, namely, North America, Europe, Asia Pacific (APAC), Middle East and Africa (MEA), and Latin America. The report profiles key players and comprehensively analyzes their core competencies. This report also tracks and analyzes the competitive developments, such as mergers and acquisitions, new product developments, and Research and Development (R&D) activities, in the market. The research methodology used to estimate and forecast the service virtualization market begins with the collection and analysis of data on key vendor product offerings and business strategies from secondary sources, such as D&B Hoovers, 10K Wizard, Bloomberg, Thomson StreetEvents, Factiva, IT service providers, technology providers, press releases, investor presentations of companies, white papers, technology journals, certified publications, and articles from recognized authors, directories, and databases. The vendor offerings have also been taken into consideration to determine the market segmentation. The bottom-up procedure was employed to arrive at the total market size of the service virtualization market from the revenue of the key market software tool providers and service providers. After arriving at the overall market size, the total market was split into several segments and subsegments, which were then verified through primary research by conducting extensive interviews with key people, such as Chief Executive Officers (CEOs), Vice Presidents (VPs), directors, and executives. The service virtualization ecosystem comprises vendors such as CA Technologies (US), IBM (US), Micro Focus (Formerly HPE) (US), SmartBear Software (US), Parasoft (US), Tricentis (Austria), Cavisson Systems (US), Cigniti (India), Cognizant (US), Wipro (India), Sogeti (France), SQS (Germany), Maveric Systems (India), Prolifics (US), Axway (US), Crosscheck Networks (US), Delphix (US), Postdot Technologies (US), WireMock (UK), Solution-Soft Systems (US), Planit Testing (Australia), Tobania (Belgium), Tech Mahindra (India), ITC Infotech (India), and Capgemini (France). These Service Virtualization Software Vendors are rated and listed by us on the basis of product quality, reliability, and their business strategy. Please visit 360Quadrants to see the vendor listing of Service Virtualization Software. 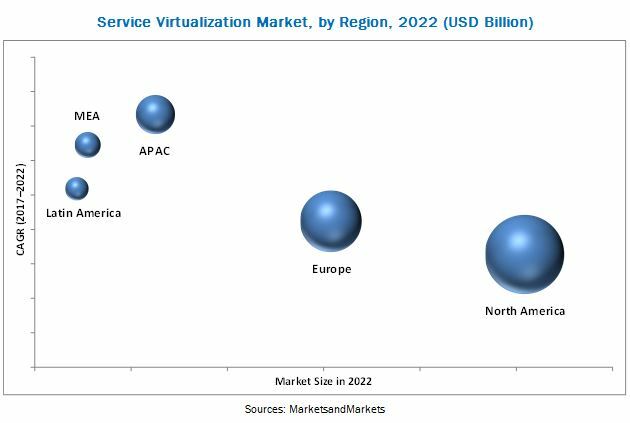 The service virtualization market is projected to grow from USD 445.5 Million in 2017 to USD 1,040.8 Million by 2022, at an estimated Compound Annual Growth Rate (CAGR) of 18.50% during the forecast period. Several factors such as enhanced quality of test conditions, leveraging of data integration, accelerated time to market, and increased ROI are driving the market. The increased adoption of service virtualization solutions and services are carried out by several industry verticals, such as BFSI, IT services, telecommunications, and retail and e-commerce, have boosted the growth of the market. The global service virtualization market is segmented by component (software/tools and services), deployment type (on-premises and cloud), vertical, and region. The services component is expected to grow at a higher CAGR during the forecast period because services help organizations in easily deploying the software either on-premises or on-cloud. The cloud deployment type is expected to grow at the highest CAGR during the forecast period. Enterprises from all verticals and of all sizes are moving from the on-premises to the cloud deployment type, as cloud deployment reduces the overall costs, provides flexibility with advanced technology, offers scalable access to solutions, ensures enforcement of security compliances, and enhances business efficiency. A major advantage of the cloud deployment type is that it provides real-time information from a remote location. Cloud-based testing platforms offer the testing teams with the ability to spin-up self-service test environments, on demand. Due to the ease of deployment, reduced cost of ownership, and improved services, Service Virtualization-as-a-Service (SVaaS) is considered as a viable testing model by many organizations. As a subscription-based service, SVaaS provides automated testing on the cloud. With Testing-as-a-Service (TaaS), companies can instantly start, scale-up, or geographically distribute their testing to accomplish more in less time, and align testing schedules with the agile and DevOps continuous delivery models. Due to the above-mentioned advantages, most of the vendors are switching from the on-premises deployment type to the cloud deployment type. The digitalization of businesses has revolutionized the application development and testing market space for various industries. To ensure competitiveness, many large-scale businesses, as well as, SMEs are leveraging the power of technology to offer the best-in-class digital solutions to their customers. These technology-enabled businesses help customers to access the services offered by them through innovative applications. Therefore, it becomes crucial for these businesses to accelerate their application development and testing cycles to reduce the time-to-market for customer satisfaction. The global service virtualization market has been segmented on the basis of regions into North America, Europe, Asia Pacific (APAC), Middle East and Africa (MEA), and Latin America to provide a region-specific analysis in the report. North America is expected to have the largest market share and is projected to dominate the market during the forecast period. This North American region is rapidly adopting emerging technologies, such as smartphones and cloud platforms. Due to this, companies are willingly investing in the North American region. Most service virtualization solutions and services vendors have an eminent presence in the North American region, and therefore, the competition is stiff among the major market players. With an increase in the demand, the cost of updating and integrating the equipment required for service virtualization also increases. However, budget constraints and evolving equipment cycle are hindering the growth of the service virtualization market. The major vendors that offer service virtualization software and services across the globe are CA Technologies (US), IBM (US), Micro Focus (Formerly HPE) (US), SmartBear Software (US), Parasoft (US), Tricentis (Austria), Cavisson Systems (US), Cigniti (India), Cognizant (US), Wipro (India), Sogeti (France), SQS (Germany), Maveric Systems (India), Prolifics (US), Axway (US), Crosscheck Networks (US), Delphix (US), Postdot Technologies (US), WireMock (UK), Solution-Soft Systems (US), Planit Testing (Australia), Tobania (Belgium), Tech Mahindra (India), ITC Infotech (India), and Capgemini (France). 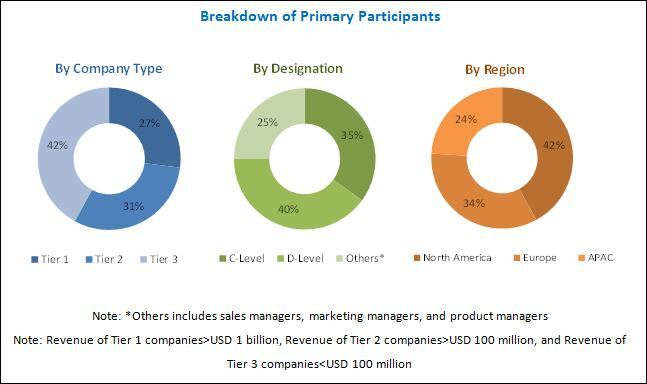 These vendors have adopted various organic and inorganic growth strategies, such as new product launches, partnerships, and collaborations to enhance their position in the service virtualization market.